There must be something in the Senate Judiciary Chairman’s gavel. From 2009 – 2010, former Judiciary Chairman Keith Kreiman refused to advance Stand-Your-Ground law. So Iowa Gun Owners did what we do best and exposed him in his district at election time — and gun owners threw Kreiman out of office as a result! For the next few years, it was Senator Steve Sodders. Sodders infamously blocked Stand-Your-Ground as the new Judiciary Chairman, despite the bill being just two votes short of passage, in a long and loud two-year battle with gun owners. And as you’ll remember, after a massive program in Marshall and Tama counties last year, funded exclusively by Iowa Gun Owners members — Sodders was thrown out of office. Now, with a new leadership in the Senate, we’re making this push again. And thanks to your calls, email, and Facebook messages, this year’s Stand-Your-Ground push (SF 262) has an impressive 24 cosponsors on it! But we should have had 25. 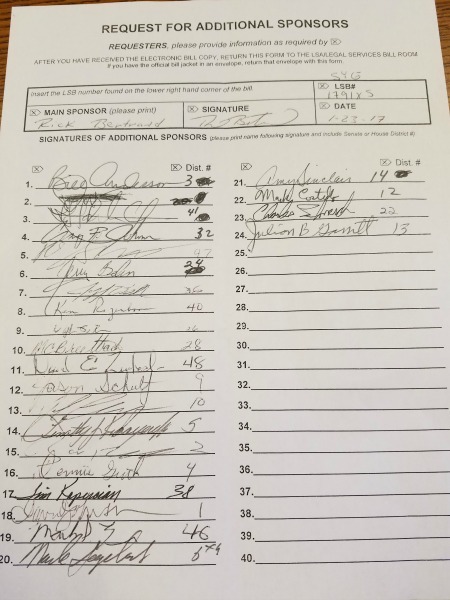 In fact, we did have 25 until Judiciary Chairman Brad Zaun walked up at the last moment and crossed his name off of the cosponsor sheet late last week! Senator Zaun is angry that gun owners in Iowa were calling the remaining members of his caucus who’ve refused to back this legislation and so he removed his name from the bill in protest. Yep, when you and I date to ask our legislators to do what we want them to do, it makes Senator Zaun angry. Even when Senators’ Bertrand, Anderson, Chelgren, Johnson (Craig), Smith, Behn, Edler, Rozenboom, Brown, Breitbach, Zumbach, Schultz, Chapman, Kraayenbrink, Feenstra, Guth, Kapucian, Johnson (David), Lofgren, Segebart, Sinclair, Costello, Schneider, and Garrett all stood up for gun owners — Brad Zaun refused. In fact, capitol insiders have reported to us that Senator Zaun is walking around telling people that he’s going to kill Stand-Your-Ground law — just like Sodders did! I don’t know about you, but I’m outraged when I think about this. Gun owners in Iowa rallied last year and threw out the anti-gun majority that resulted in Senator Zaun becoming the Chair of the Judiciary Committee in the first place! Over a hundred IGO volunteers went door to door in targeted races all over Iowa, for six weekends in a row! We sent out so much targeted direct mail exposing anti-gun legislators that we had to rent special trucks just to haul it all downtown to the post office! Our radio and TV ads were the hardest hitting ads on the airwaves -– and they were seen and heard by hundreds of thousands of gun owners in our targeted districts. All told, Iowa Gun Owners spent $150,000 of your money exposing anti-gun incumbent Senators! And each time, educated gun owners reacted and threw the incumbents out of office. For Senator Zaun to pull this stunt and to oppose Stand-Your-Ground law when gun owners put him there in the first place is outrageous. That’s why I hope you’ll contact Senator Zaun immediately and demand that he publicly support SF 262, Stand-Your-Ground law for Iowa! Specifically, tell Senator Zaun to use his position as the Chairman of Judiciary and move the bill through the committee right away with no weakening amendments! Iowans have fought tooth and nail for this legislation for a long time, having retired dozens of legislative careers in the process. Senator Zaun is on the wrong side of history, by refusing to advance Stand-Your-Ground legislation which is already law in dozens of states! He’s on the wrong side of his caucus, too, as dozens of them have already supported this legislation as cosponsors. And he’s obviously on the wrong side of what Iowans want, as they crushed every single anti-gun incumbent Senator who was up this year for their refusal to support this legislation. So please contact Senator Zaun immediately, and tell him to advance Stand-Your-Ground law! When you’re done, please forward this email to as many gun owners as you can and urge them to get involved, too. We have come too far and have fought for too long to let Senator Zaun shut this bill down. Please take action at once! P.S. The new Chairman of the Senate Judiciary Committee, Brad Zaun, is following in his predecessor’s footsteps by announcing last week that he’s not going to support Stand-Your-Ground law! In fact, after cosponsoring the bill, SF 262, along with dozens of other Senators, Zaun removed his name late last week in a fit of anger. This is unacceptable, as the only reason he’s the Chairman of the committee in the first place is because gun owners flipped the Iowa Senate last fall! Please contact him, right now, and demand that he move Stand-Your-Ground law through the Judiciary Committee right away -– with no weakening amendments. >>> Calling him at (515)306-7868. >>> Calling him at (515)276-2025, if you can’t get through on the other number. >>> Emailing him at [email protected]. Please contact him right away — there’s no time to lose. And when you’re done, forward this message to your friends and family, too. Rep. Ako Abdul Samad Files More Aggressive Gun Control!